The famous bridge in the Ironbridge Gorge can be seen from both sides of the river, but you can’t cross the bridge (so you miss the primary experience of crossing the bridge). You start your explorations of U. S. Route 66 on a dirt road somewhere in the California desert while the map points to Chicago. It should start at one of the ends, but even so, I’m not sure what people will learn by clicking through a couple thousand miles of highway. Perhaps just a handful of representative sites along the route would have been more useful. You can go inside the Peace Memorial in Hiroshima (finally inside!!) but alas, you can’t look up to experience the famous dome nor can you go around the building. I should also warn you that the wide angle lens can really distort your view and become disorienting at times. The technology works best for large open spaces but close up, buildings like Independence Hall become circular and you can lose your way (the gardens at Stowe are just exhausting to navigate). 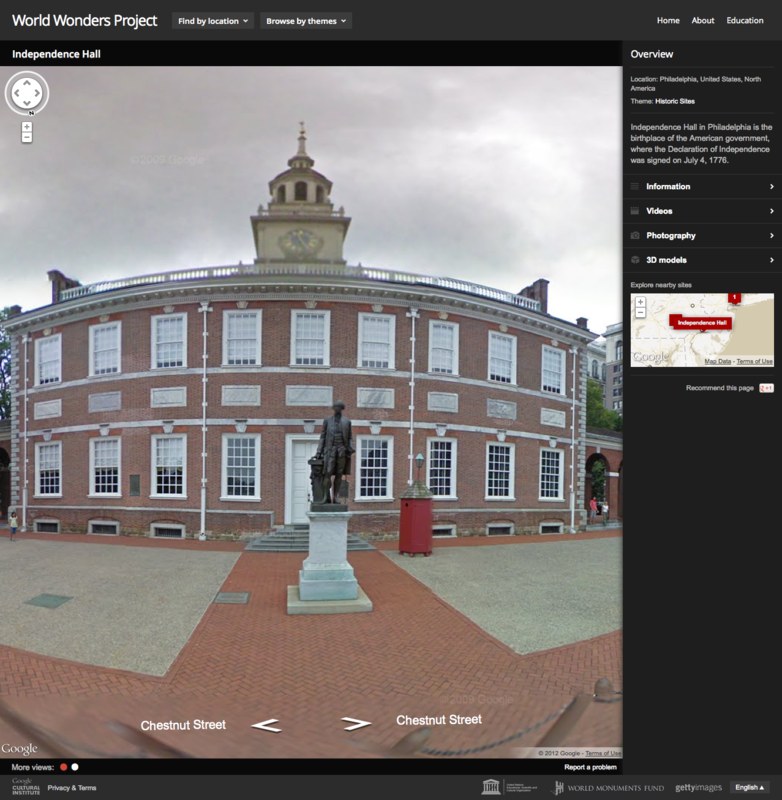 The World Wonders Project is one of several diverse products coming out of the Google Cultural Institute. If you want to be impressed, check out the Art Project or Dead Sea Scrolls, or see if you’re as puzzled by the Nelson Mandela Centre of Memory as I am.